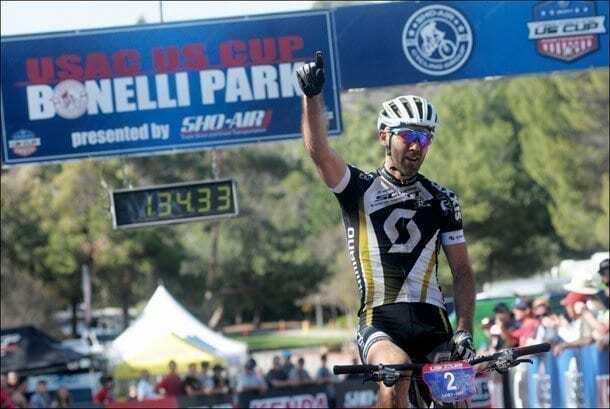 Geoff Kabush (Scott-3Rox) and Katerina Nash (Luna Pro Team) won round 2 of the USA Cycling US Cup Pro Series presented by Sho-Air Cycling Group in Bonelli Park in San Dimas, California, on Saturday afternoon. With two rounds done and two to go, Kabush and Nash also lead the USA Cycling US Cup Pro Series. Katerina Nash won her second consecutive USA Cycling US Cup Pro Series race of 2014 on a warm, sunny Saturday afternoon at Bonelli Park. The Czech rider dominated the elite women’s cross country mountain bike race from start to finish. Nash and her Luna Pro teammate Catharine Pendrel rode away from their competition on the first lap of the five-lap race. Behind them, Emily Batty (Trek Factory Racing) led the chase while Daniela Campuzano Chavez Peon (Mexican National Team), Georgia Gould (Luna Pro Team), Mary McConneloug (Kenda/Stan’s NoTubes), Evelyn Dong (Backcountry.com) and Mikaela Kofman (Scott-3Rox) followed. Near the end of lap three of the UCI category HC race, Nash rode the uphill A-line and got a gap on Pendrel, who opted for the longer, but less technically challenging B-line. Just a few seconds was all Nash needed to make her move. She applied pressure and quickly turned her advantage into a decisive lead. Nash would ride the remaining laps, uneventfully, on her own at the front of the race on her way to victory. Pendrel, once left to ride on her own, measured her effort for the duration of the race and successfully defended her second place while Batty and then Campuzano each rode solo to third and fourth places respectively. The tightest battle was for the fifth and final podium spot. A chase group of four women formed in the final laps, including Gould, McConneloug, Dong and Kofman. While Gould and McConneloug faded as the race progressed, Dong and Kofman became stronger. In the end, Dong made a last lap move to secure herself a fifth place finish. Bonelli Park drew an impressive 41 elite women to the start line. 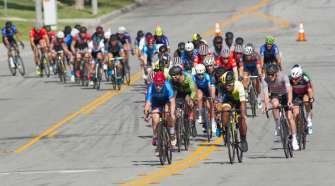 In the elite men’s race later in the afternoon, veteran racer Geoff Kabush rode a tactically smart race to bide his time and attack for the victory after his top rivals had already tired themselves out. Seven men formed a lead group on the first of seven laps including Olympic bronze medallist Marco Fontana and Manuel Fumic (both Cannondale Factory Racing), US Short Track National Champion Todd Wells (Specialized), Sergio Mantecon Gutierrez (Trek Factory Racing), Geoff Kabush (Scott-3Rox Racing) and US Cross Country National Champion Stephen Ettinger (BMC). As the first man to attack, Fontana surged on lap two and established a 10-second gap over the other six men. His teammate Fumic crashed in the uphill rock garden, but recovered well to quickly chase back on. The gap from Fumic’s crash helped Fontana, and he pushed the pace off the front on his own for two laps. Kabush seemed to barely hang on to the main chase group, but after the race, he admitted that he was just conserving his energy. Plaxton calculated that it was time to reel in Fontana on the fourth lap, and he did just that to bridge up to the Italian so that the two riders rolled through together as the race leaders with three laps to go. The savvy Kabush knew that it would not be a good idea to let Cannondale Factory Racing teammates Fontana and Plaxton get away together, so he chased them down and joined them. Taking barely a breather after his effort to bridge, Kabush wasted no time in counter-attacking the duo and getting a gap on them. With two laps remaining, Kabush lead Plaxton by about five seconds, but the early effort had already cost Fontana, who had dropped further back and was then caught by Mantecon. Wells rode on his own in fifth place, ahead of Fumic and Ettinger. As Kabush continued to apply pressure, Plaxton blew up and Kabush quickly extended his lead. Plaxton struggled to hold off Mantecon until the Spaniard eventually overtook him just before the bell lap. Meanwhile, Wells’ consistency on the day started paying off as he bridged up to and passed Fontana – the two rode across the line together with one lap to go. At the front, Kabush cruised to a solo victory on the final lap, finishing with plenty of time to enjoy the feeling of taking the win. 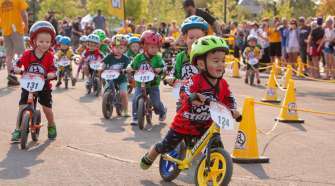 Many racers were excited to have the chance to compete in a UCI category HC event on North American soil; it was the first such race in the US in mountain biking’s history. Mantecon followed for second place on the day while an exhausted Plaxton held on for third. Wells finished strong to take fourth place while Fontana ended up in fifth place. After round two of four in the USA Cycling US Cup presented by Sho-Air Cycling Group series, Kabush leads the series ahead of previous series leader Plaxton and Wells while Nash continues to lead the series ahead of Pendrel and Batty. 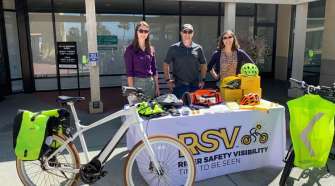 The USA Cycling US Cup presented by Sho-Air Cycling Group series will continue with round 3, a UCI Category HC race in Fontana, California on Saturday, March 22. 110 elite men lined up in Bonelli Park. Check back soon to SoCalCycling.com for a Photo Gallery by EchelonDesignPhoto.com from the Pro Men’s and Women’s Cross Country race.